Ellen is a graduate in Horticultural Technology and Landscape Design from the Nova Scotia Agricultural College (Dalhousie University, Faculty of Agriculture). She has attended colleges in Nova Scotia and Ontario and completed additional courses in Landscape Sales and Management. 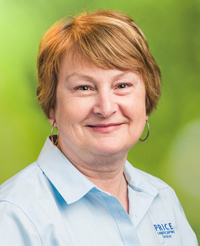 Ellen is a Landscape Industry Certified-Designer, a national designation of the Canadian Landscape Association (CNLA). This certification is achieved through a written examination, along with necessary educational and industry experience proving a high degree of proficiency in landscape design. Prior to this national certification Ellen achieved her Landscape Design Certification for Atlantic Canada through the Atlantic Association of Landscape Designers (AALD). Ellen’s work has won industry awards for excellence in landscape design and construction. The annual Awards of Landscape Excellence in New Brunswick recognize exceptional quality and leadership in the Landscape Design, Construction and Maintenance fields throughout the province. She gives back to the industry by volunteering her time as President of the Atlantic Association of Landscape Designers, and as Chair of the National Landscape Designers Committee. Ellen is an active member of Business & Professional Women’s Club of Greater Moncton and serves as Chair of Mentorship for the organization.